Arrival at Tribhuvan International Airport at Kathmandu and meet, assist and transfer to the hotel by our representative. Welcome drinks on arrival and briefing of tour program by one of our representative from the company. Today after breakfast we visit the Kathmandu Durbar Square the medieval Kings palace who ruled the then Kathmandu Kingdom. 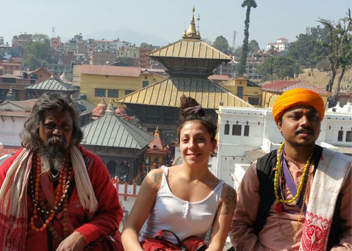 Visit Hanuman Dhoka Palace, temples, Meet Kumari, Living goddess and receive blessings from her, visit Akash Bhairab and Annapurna Temple, Budhanilkantha- Budhanilkantha Temple to offer prayers at one of the most-loved Vishnu temples of the valley. Observe the intricate artwork that went into the sculpting of the magnificent 5th century image of the sleeping Vishnu. Pashupatinath Temple is a famous, sacred Hindu temple dedicated to Pashupatinath located on the banks of the Bagmati River. You can see Arati at Pashupatinath Temple in the evening. After breakfast drive to Pokhara for around 6-7 hours. Enroute visit Manakamana Temple. 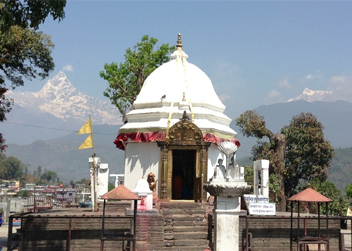 Manakamana Devi temple is a highly venerated sacred place of the Hindu Goddess Bhagwati, an incarnation of Parvati. The name Manakamana is derived from two words, Mana, meaning heart and Kamana, meaning wish. Pokhara also called the city of Lakes. The city offers you to view the magnificent view of the Dhaulagiri, Machhapuchhre, Manaslu and five peaks of Annapurna and others. From the flight you can see the beautiful mountains that will follow you throughout the flight on your right hand side and on left hand side. Check in hotel and rest for sometimes after hot shower. Strolling around lake side, hire a boat and visit Barahi Temple - unique temple situated in the middle of Phewa Lake in the evening. After morning breakfast fly to Jomsom. With a view of mountains, hills and forest we reach to Jomsom. It is a town located at an altitude of about 2700m in Mustang District. 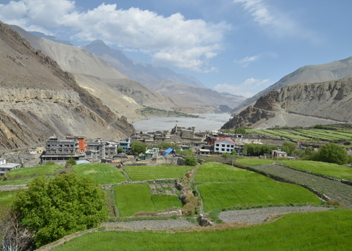 Today you can acclimatize yourself and explore around Jomsom. After breakfast, we drive to Muktinath for around 3 hours. 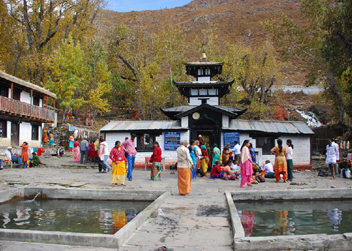 Muktinath is an important pilgrimage site for both Hindus and Buddhist. The area hosts a Vishnu temple and a Monastery nearby. Muktinath itself demonstrates the religious harmony in Nepal. After exploring Muktinath drive back to Jomsom. Overnight at Jomsom. After morning breakfast fly back to Pokhara. Rest of the day is free on your own. 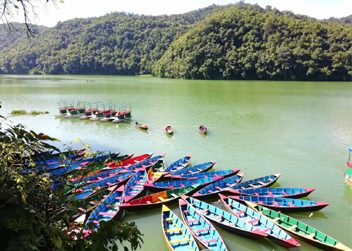 You can explore Pokhara on your own. 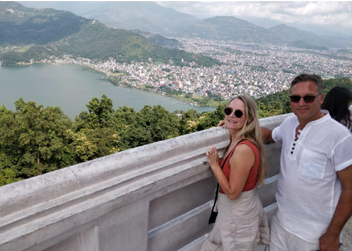 Today we visit some Buddhist landmarks in Pokhara and also enjoy nature's majesty. The massive Buddhist stupa of World Peace Pagoda was constructed by Buddhist monks from the Japanese Nipponzan Myohji organization on a narrow ridge high above Phewa Tal. 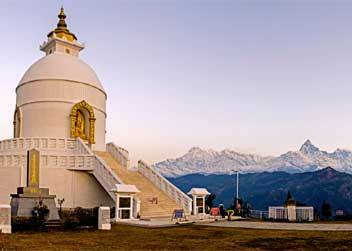 Besides being a cultural monument, the site is also famous for the panoramic view of the Pokhara Valley. We cross the Phewa Lake on a boat and then hike to the Stupa. Then we will visit the Malepatan Gomba or monastery at Malepatan. Then we make another hike to Hyangja, the site for Tibetan refugee camp who fled Tibet after the Cultural Revolution in China. You may try the Tibetan variety of foods, bargain for curios, and at the same time acquaint yourself with the Tibetan culture. There is the Tashi Palkhiel monastery in the tradition of Karma Kagyu tradition. We drive to Lumbini today - about 290 kilometers south-west from Pokhara which takes about 6-7 hours. We bid goodbye to the Himalayas in Pokhara, and head toward more flat land of Nepal's Terai. Generally, the weather gets hot and humid in the plains except in the winter. Perhaps, Lumbini is the most important Buddhist pilgrimage site - the place where Buddha was born. In case we reach Lumbini around the sunset time, we can stroll in the local market to have a glimpse into the local lifestyle. 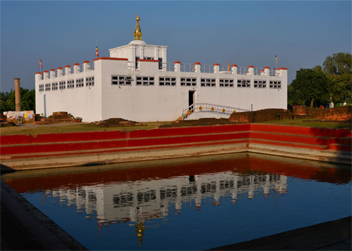 Lumbini is one of world's major religious, architectural, and historical places. We devote today's time visiting as many places and sites in Lumbini as possible. The place is really a big area with monuments, temples, and ancients sites making it a UNESCO World Heritage Site. First we visit the Mayadevi temple which is built on the exact place where Buddha was born. We spend some time wandering around the gardens. We also visit the museum and peace pagoda. Some of the important landmarks and monuments in Lumbini include: Ashoka's Pillar erected by Emperor Ashoka (249 BC) on the spot of Buddha's birth which also has the oldest inscription in Nepal. There are many Buddhist Temples founded by the devotees from different countries: Tibetan, Chinese, Japanese and Burmese, Korean, etc. We are nearing the end of our Buddhist Cultural Tour. We head back toward Kathmandu today. It is around 7-8 hours drive from Lumbini. Rest of the evening you can scroll around touristic places. After breakfast drive to Dhuklikhel for around 2 hours. Start hike to Namobuddha, Buddhist site for around 3 hrs. The main attractions of this hike are the fantastic panoramic mountain views and the many Buddhist stupas on the hilltops. Namo Buddha is also famous for growing rice, mustard and millet so you can see beautiful hillside terraced farms throughout the walk. You’ll also be surprised by the number of temples, variation in landscapes and diversity of people living in harmony. Overnight at Namobuddha. After breakfast drive back to Kathmandu for around 2 and ½ hours. Check in hotel. Rest of the day is free for rest and refreshment in hotel. Evening you will be given leisure time to scroll and shopping around the touristic places. Today after breakfast we visit the Boudhanath Stupa, one of the largest stupas in the world and an important Buddhist pilgrimage. The unique octagonal Mandala design with hundreds of prayer wheels and the 108 images of the Buddha set into the niches around the huge structure. 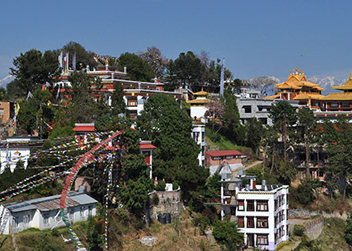 The area of Boudhnath is also famous for over 50 Tibetan Gompas or monasteries, also being known as the 'Little Tibet'. 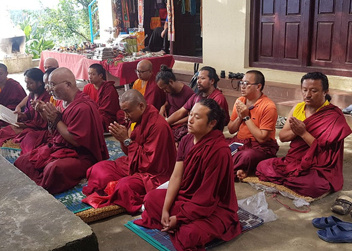 We will keep Hi Tea Buddhist Ceremony in one of the monastery in Boudha where monks perform their ritual, chanting Buddhist mantras and pray for our good health and prosperity. At the end of the ceremony, monks offer blessed food and Hi Tea for all. The Kapan Monastery at Kapan Hill, a few kilometers higher north from Boudhanath is also known as Nepal Buddhist Mahayan Centre. 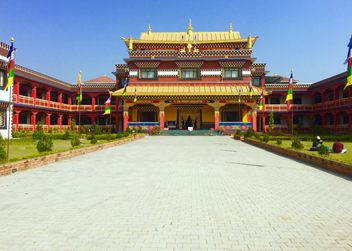 There is a nunnery nearby the main monastery, known as the Khachoe Ghakyil Ling Nunnery, home to about 400 nuns. 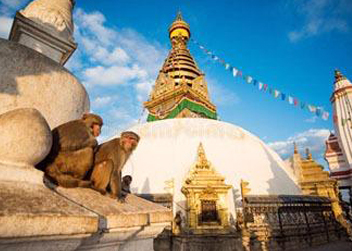 After then we drive to Swayambhunath Stupa which is one of the oldest Buddhist monuments in the world with more than 2000 years of history and also a major Buddhist pilgrimage. After breakfast drive to Bhaktapur via Changunarayan. 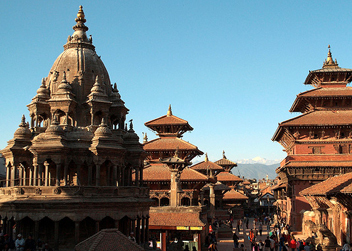 Bhaktapur, or the Town of the Devotees, preserves medieval arts, architecture, culture, and lifestyle to this date. 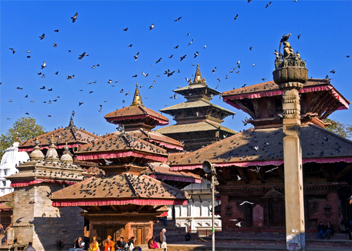 Bhaktapur Durbar Square is the best preserved one of the Valley's three Durbar Squares. 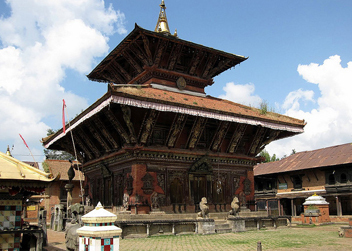 Visit Changunarayan, the oldest pagoda temple in the Kathmandu valley. Drive back to Kathmandu. Further visit Patan Durbar Square a distinct place for arts and architecture that is reflected on each temple, monument and palace building that were mostly built during the Malla period between 16th, 17th and 18th century. •	An Experience English speaking guide during sightseeing in Kathmandu, Pokhara, Lumbini and Bhaktapur. Guide will be different in four places.